As always we hope you will enjoy and find value in reading our monthly HTM newsletter. Of particular importance this month please take note that the sixth annual National Bioenergy Day is October 24 th . 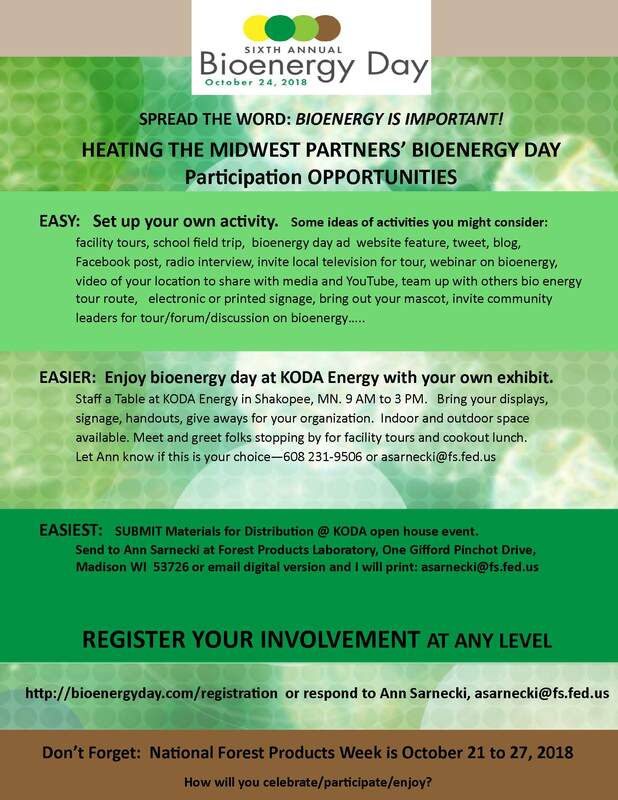 There is a registration website set up athttp://bioenergyday.com/registration/ so be sure to register your involvement and/or activities. Please note that Koda Energy is planning a large event to include tours and a barbeque lunch at their facility in Shakopee Minnesota and have offered to piggyback the participation of other HTM members with their event. This could include a booth, informational tables, etc. In other news, there is a webinar being planned and materials being prepared to relay information in regard to the Midwest Biomass Exchange. Final details are still being prepared, but look for these informational opportunities later this fall. The HTM steering committee is currently reviewing options for a 2019 event. Some ideas include a co-located conference with a partnering organization or possibly an industry tour with an evening reception and/or a moderated HTM strategy session/business meeting the following morning. If anyone has ideas please reach out to any of our steering committee members to let us know your suggestions. Finally, please note that our next combined action team call is scheduled for 1:30 PM CST on October 16 th . All are welcome to join our action teams. Participate in National Bioenergy Day! More than 30 organizations, including the Biomass Thermal Energy Council, Alliance for Green Heat and Pellet Fuels Institute, sent a letter to leaders of the Senate Agricultural Committee on August 17 urging the Senate to expand the Community Wood Energy and Innovations Program in the final version of the Farm Bill. On August 10, the U.S. EPA delivered a pre-rule to the White House Office of Management and Budget related to a 2015 rule that set performance standards for new residential wood heaters, hydronic heaters and forced-air furnaces. This is the second time in August the EPA has delivered a proposal pertaining to the 2015 rule to the OMB. The EPA finalized a rule in February 2015 that made revisions to the new source performance standard (NSPS) for new residential wood heaters. The rule updated 1988 NSPS to reflect advancements in wood heater technologies and design. It also broadened the range of residential wood-heating applications covered by the regulation. Of the 518 wood and pellet stoves currently on the market in the US, 91 or about 18% are certified to the stricter emission standards that are set to take effect on May 15, 2020. In general, smaller companies with fewer models tend to be more prepared for the 2020 deadline than larger companies with many models. Pellet stoves can meet the 2020 emission standards relatively easily, and some companies that make only pellet stoves have fully 2020 compliant product lines. On Sept. 17, the Hearth, Patio & Barbecue Association issued a statement in support of a bill that aims to push back the effective complaince date of new source performance standards for residential wood heaters, hydronic heaters and forced-air furnaces for three years, from May 15, 2020 to May 15, 2023. Fostering Wood Recycling in Michigan – Register Now! Purpose: Watch a new documentary called “The Power of Minnesota” which tells the story of how clean energy is making local economies throughout the state even stronger. During this free event, you’ll enjoy appetizers and refreshments, join a community conversation, celebrate Bemidji’s clean energy developments, and learn how you can take action on your own projects! USDA’s Rural Energy for America Program (REAP) grant can cover 25% of project costs and a project can begin after an application has been submitted. Applications are due April 1, 2018 for projects of any size. REAP grants are competitive (1 in 4 applicants awarded). MDA Biomass Thermal Energy Incentive Program . This is a production-based incentive and pays out based on heat generated by using mostly Minnesota-sourced biomass. Additional details available here . MDA AGRI Value Added Feasibility Grant Program The Minnesota Department ofAgriculture (MDA) will reimburse up to 50% of the costs, with a maximum award of $35,000, for an independent third party consultant to conduct a feasibility study of your agricultural value-added business venture. Any Minnesota resident or business can apply to receive funding to do a feasibility study for a new business or expansion/diversification of an existing business that will add value to a Minnesota agricultural commodity or product. This includes but is not limited to farmers/farmer networks, agricultural cooperatives, and agricultural businesses. Heating the Midwest Incorporated has created a LinkedIn page and also a Facebook page. Follow the page to stay up to date with what we’re working on! Also follow us on Twitter. Heating the Midwest- Become an Action Team Volunteer! If you have a specific area of interest related to biomass thermal, we welcome your participation in one or all of HTM’s three action teams-Biomass Combustion Technologies, Biomass Policy & Benefits, and Biomass Resources & Demographics. Is your time often stretched? No problem. Time committed to the HTM effort is volunteer time. Joint action team calls are held monthly via conference call, and calls are limited to one hour in respect of members’ time and busy schedules. Members may choose to volunteer more of their time individually to support Action Team specific projects as they arise. Individuals with a passion for biomass thermal energy are being sought to lead the Biomass Resources & Demographics Action Team or the Biomass Combustion Technologies Action Team. This is a great opportunity to share your leadership skills in furthering the mission of HTM and to directly connect with the biomass industry sector and other agencies—all with a goal of growing market opportunities for biomass and specifically for biomass as a fuel for thermal heating and cooling, and combined heat and power. The work of the action teams involves developing “boots on the ground” projects for spurring action, discussing industry challenges in each sector and how to possibly address, networking and supporting the overall goals and vision of the Heating the Midwest with Renewable Biomass initiative in an effort to grow demand and expand marketing opportunities in the biomass thermal sector, and create awareness of biomass thermal. HTM Joint Action Team calls are held the >> Third Tuesday of each month at 1:30 p.m. CST <<. Separate action team calls are scheduled as needed. For more detailed information on the Biomass Resources & Demographics Action Team, please contact Mike Marsollek ( MMarsollek@kodaenergy.com ); and for the Biomass Policy & Benefits Action Team, please contact Gregg Mast (Gregg_Mast@earthtechenergy.com ). Questions pertaining to the Biomass Combustion Technologies Action Team can be forwarded to either action team chair noted, or feel free to contact Becky Philipp ( bphilipp@auri.org ), steering committee member.